Doing this in chronological order would be too easy. So I won’t. I started thinking about this recital a while ago. In fact, I started thinking about it shortly after my last recital, a chamber music extravaganza, last April. To some people, that might seem like a lot of time to plan a recital. It’s really not. 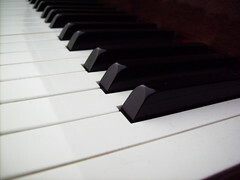 When I was doing piano stuff in high school, at the very end of my study, it was taking me months and months just to learn a piece. I think it took me almost a year to learn a complete Beethoven Sonata. So four months is pretty snappy. This first thing I did was to secure my pianist, Michael Dauphinais. He’s ostensibly on faculty at my school, but he really isn’t utilized the way he should be. Why Michael? Because he’s easy to work with, professional, and a lovely, musical pianist. He played for me for my first doctoral recital and it was such a joy to work with him. The second thing I did was try to find a date that worked for me, my committee of three, Michael and the school at three different halls in two venues. At previous institutions that I’ve attended, there was always a designated period for degree recitals and the faculty gave their availability to scheduling people. 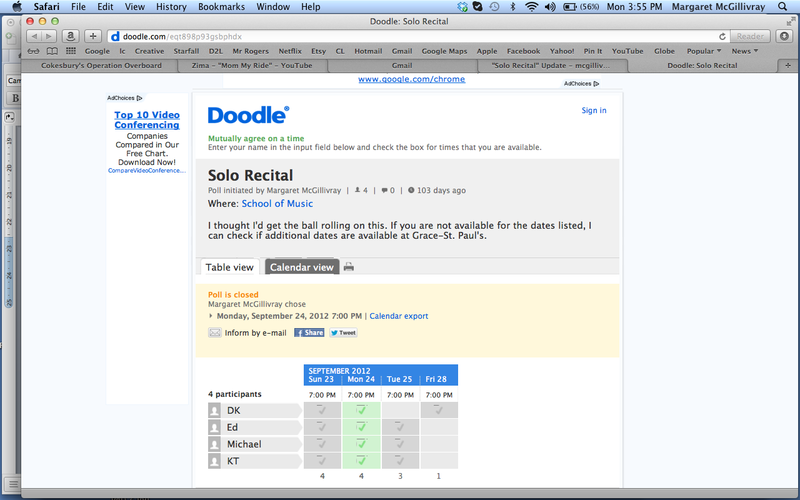 So I just go down to the scheduling people and I could pick from there (or, in the case of McGill, they told me when my recital was and that was that). But not here. Sigh. So I did a doodle poll with a bunch of times and places and between the bunch of us, we found a single date (out of about 10, whittled down to 4) which I then immediately booked with my committee, Michael and the venue. Doodle is both annoying and awesome. Awesome, because you can ask a bunch of people about scheduling. Annoying, because people don’t get back to you all at once and you keep getting an email every time someone finally gets back to you. Kind of like Chinese water torture. And there’s almost always a lone holdout. But I digress. Since I decided to use an off campus venue, I actually forgot to tell the school until the end of August. Oops. There was a form that everyone on my committee had to sign that approved the music I chose and the date and venue (again) and there was another card that just my supervising professor had to sign so that the school would even know the recital was happening. That was the one I forgot. It’s due 30 days before the recital. I think it waltzed in about 21 days before. They knew about the recital but this was just one of those crossing the “t’s” moments that I’m not always good at/don’t care to remember. I also had to book the recital venue and I ended up choosing something off campus. Why? The two halls that are available at school don’t have great acoustics – one is too boomy and the other swallows you up (or me at least). The real kicker is that you have to pay for them and it’s not a minimal $25 fee or something. I’ve just gotta say – I really disagree with this. I have to present 4 recitals because of my degree. I have already paid fees and tuition because of my degree (ok, I’ve got scholarships, but there are always some little things that add up). I’m already charged an extra fee for lessons because of my degree. One would think they’d let you use the hall in the school that you’ve paid tuition and a pint of blood to attend for the recitals that you need to present BECAUSE OF THE DEGREE. 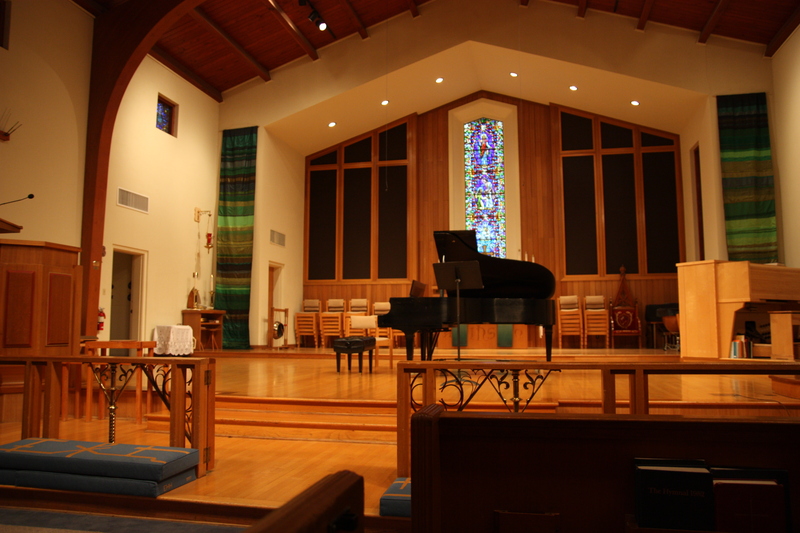 Anyhow, I chose an Episcopalian church used to having chamber music concerts and recitals. It’s fairly close to campus. They’ve got a nice Baldwin grand in there (never thought I’d say that about a Baldwin, but there’s a first time for everything) and the staff at Grace-St. Paul’s was lovely to work with. Not too much visual clutter and the only thing I really needed to think about was where I was going to stand. I did my first recital for my DMA here, so it was almost comforting. That help, the comforting bit, when you’re under stress. I’d imagine these things get worse when you don’t know what you’re walking into. You control what you can and this was something over which I had a say. And there’s a built-in fence there in case anybody in the audience gets rowdy and rushes the stage.